Air Tank Closeup. 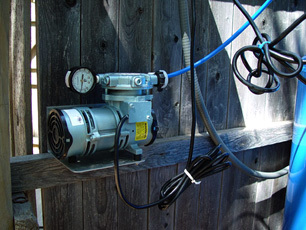 The MaxiVent system consists of a solenoid valve which opens when the air pump runs and closes to form an air pocket when the air pump is not running, and a ball valve — just under the solenoid — that allows a physical adjustment of the flow of air and water from the tank. 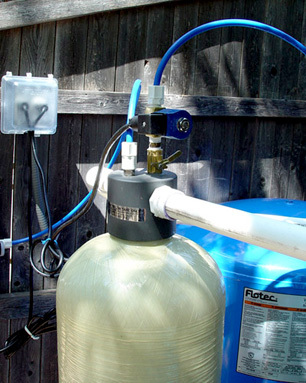 The Air Pump, the heart of the aeration system, puts air into the aeration tank at a pressure slightly higher than the water pressure so that a pocket of air is always maintained in the top third of the tank. As water to be treated enters the tank, it hits a baffle and sprays down through the air pocket.